Welcome to the starting point for your west coast adventure. Our resort is located in the heart of the quaint town of Ucluelet, British Columbia. Ucluelet offers many opportunities to explore the outdoors and enjoy different recreational activities such as fishing, hiking, whale watching, kayaking, surfing, and more. Our resort is a short walk away from the Ucluelet Aquarium, the Wild Pacific Trail, many restaurants, shops, and other pleasantries the town has to offer. 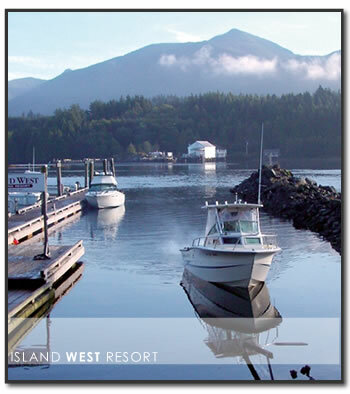 We also have on site the Eagles Nest Pub & Restaurant that overlooks the beautiful Ucluelet Inlet. At our resort guests can share their stories of the great catches of the day on the water, their memorable family times over the campfire, and their convenient motel stays. What we value most here is a secure and easily accessible marina with moorage, a variety of serviced campsites, and convenient and budget-friendly accommodations. Our hope is that we can exceed your expectations and provide you an outstanding service at our resort. Thank you for your continued patronage at our resort. Be sure to book your next trip with us to secure lower rates and your favorite spots. We look forward to welcoming you back to Island West Resort in the years to come. Please take note of our policies while staying with us. Check out time is 11am - Late check outs are not available. Check in time is 3pm - Early check ins are unavailable. Note: Advance Moorage bookings will be accepted starting June 1st of each year. Advance bookings for Motel Rooms plus Moorage or RV sites plus Moorage will be accepted beginning October 1 of each year. Motel: Bookings must be canceled 7 days prior to arrival date to receive a full refund less a $20 booking fee. There are no refunds for early check outs under any circumstance and the full amount of the booking will be charged. Marina and RV: Bookings must be canceled 30 days prior to arrival date to receive a full refund less a $20 booking fee. There are no refunds for early check outs under any circumstance and the full amount of the booking will be charged. Pets: Are welcome on the property but must be leashed at all times. It is also the responsibility of the owner to clean up after the pet. We have pet friendly rooms available upon request however if a pet is found in a non pet friendly room a $100 fee will be charged. Smoking: Smoking is not permitted in any of the motel rooms. Ashtrays are available outsite however, smoking must occur away from all open doors and windows to ensure it does not enter any rooms. Only authorized vehicles are allowed to be parked in the motel parking lot. Boats and trailers are not permited in the Motel parking area and will be towed if they are not in our boat and trailer storage area.